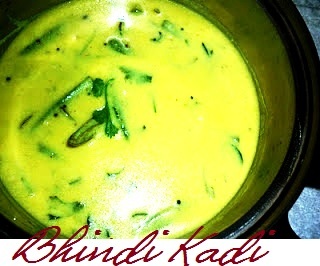 This recipe is called Kadhi and it is from the Indian state Gujarat. Basically, Kadhi means thick gravy using yogurt, chickpea flour etc.Kadhi is an every day food in many northern parts of India. It’s very healthy, since it has Protein from the Chick pea flour, Calcium from yogurt and Vitamins from the veggies .It’s a good combination with plain rice. Okra or Ladies finger is packed with nutrients. 1. The vegetable is a good provider of good bacteria called the probiotics. Probiotics helps in biosynthesis of vitamin B. 2. It is said that Ladies Finger is anti-diabetic. Means it helps to reduce the blood sugar. 3. It helps in healing acid reflux. 4. Also it helps in reducing he risks of diseases like Cancer. This Curry is so very tasty; I got real appreciation from all in my family. So you can give it a try. 1. Blend 1 cup yogurt, 2 tbsp chick pea flour, turmeric powder, salt and 3 cups water using a hand blender. 2. Heat oil along with clarified butter and splutter mustard seeds. 3. Add all the ingredients and okra. 5. Finally add the yogurt-chickpea mixture. 6. Keep stirring on a low flame to prevent curdling. 7. Make sure the chick pea flour has cooked well .Simmer for 3-4 minutes. The sauce thickens. 8. Finally, u can add some chopped ginger.